Glee Wedding Songs Are Fantastic! My daughter has been watching GLEE since it started and I have heard several songs that are really great but this last episode about Glee Wedding really hit it! I asked my dear daughter to look up the video in Youtube and here it is! I bet some bride-to-be's are wanting to have a GLEE-ful wedding too! 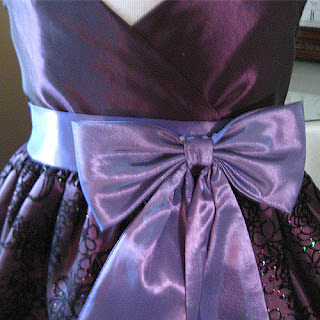 Customer Photo: Certified Elite Dressers for the Holidays! These lovely girls are wearing Girls Aqua Blue Chiffon tent Dress and Girls Rose Chiffon Tent Dress and I'm pretty sure that these photo will be forever cherished by the girls and their families! Happy Holidays, everyone! 26 days more to go before Christmas!!! Shop girls holiday dresses at EliteDresses.com today and enjoy huge huge savings! I overheard two ladies talking at a burger joint my daughter and I went to earlier. One lady said that she got her daughters holiday dresses from a branded boutique and she complained that it was too expensive but she needed to impress her husband's boss so she bought it. The other lady said she got her daughters' holiday dresses from an online store and paid half the price of what her friend got from the branded boutique--and that includes shipping fee! At this point I wanted to turn around and give them my business card! But I was too shy. Anyway, it's true that you can save more on online shopping. You don't have to pay for the sales tax plus online stores has FREE SHIPPING OPTIONS if you're not in a hurry to use the item so it's ALWAYS nice to shop early. 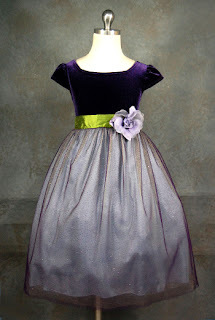 Browse through EliteDresses.com's Girls Holiday Dresses Collection and ready yourselves to fall in love with our dresses! Moms, Would You Buy Your Daughter a $1,600 Princess Dress? Yes, apparently there's a store that customizes a princess dress complete with "other" accessories that would cost at least $1, 600! So, would you buy a $1,600 princess dress? Personally I would not, FOR SO MANY OBVIOUS REASONS. 1. I can buy the same quality princess dress for a fraction of its cost. 2. $1, 600 for a dress that she will outgrow in a few months and most likely forget about it. 4. There are many who suffer from hunger because they lack money to feed their family. I would rather donate that to a family to have something to share together during Christmas. Speaking of which you can avail of a princess dress at Elite Dresses and it's NOT EVEN CLOSE to $1, 600 even if you buy a princess dress for 5 more kids! I wouldn't want my child to watch it and have nightmares after. I am quite disturbed by the review made on A Christmas Carol which mentioned about grotesque imagery. I suggest that you take caution when looking for Christmas movies to treat your kids to. Starring: Jim Carrey, Bob Hoskins, Colin Firth, Carey Elwes, Gary Oldman, Sammi Hanratty, Robin Wright Penn, Jacqui Barnbrook. Synopsis: [from the distributor] From Walt Disney Pictures comes the magical retelling of Charles Dickens' beloved tale - "Disney's A Christmas Carol", the high-flying, heartwarming adventure for the whole family, starring Jim Carrey. When three ghosts take penny-pinching Scrooge on an eye-opening journey, he discovers the true meaning of Christmas - but he must act on it before it's too late. Complete with spirited bonus features, this exhilarating and touching Disney classic is destined to be part of your holiday tradition, adding sparkle and heart to all your Christmases yet to come. Happy Thanksgiving From ours to yours! Our first ever blogger giveaway sponsorship has announced a winner! Our Price: $44.99 You save $25.00! Make every occasion merry with this pretty dress! Our Price: $49.99 You save $40.00! Burgundy and Green is the perfect combination to celebrate special occasions! Congratulations and thank you to those who joined! There will be another blogger project soon so watch out for that! 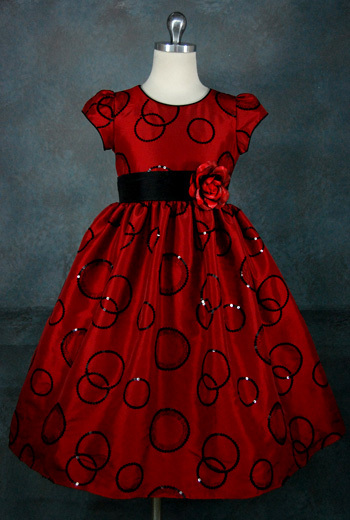 Aside from your child's birthday, Christmas is the time where you buy her a new dress. 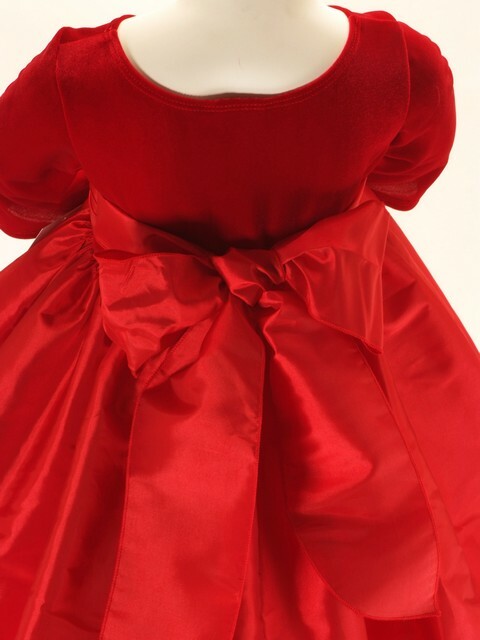 Over the years, girls holiday dresses has improved in terms of its style. Surprisingly plum or purple is seemingly popular this holiday. 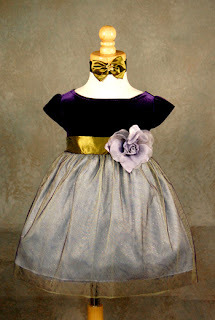 The usual holiday colors sell well too like red, green and gold but what's really "in" this season is the color combination of girls holiday dresses such as purple and gold, black and silver, and black and red. Its seems the US and UK sizes are the same for kids. 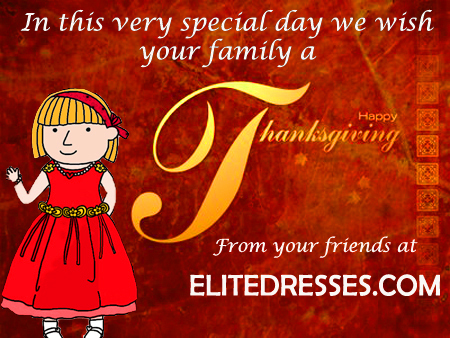 Avail of EliteDresses' Thanksgiving deals this week! Lots of gorgeous girls holiday dresses on sale! All dresses are under $50 and FREE SHIPPING still applies. Be Fun and Stylish - with a TWIST! It's an open secret that bouncy skirts make girls dream of castles, kings and queens and being the fairest in the land... Your little girl will feel like a pretty princess with this Pink Poly Dupioni Sleeveless dress with bouncy skirt and pretty flower sash. Crisp and smart, your daughter will be in this dainty dress!